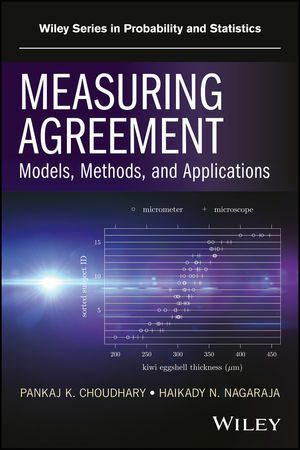 Measuring Agreement: Models, Methods, and Applications is a resource for statisticians and biostatisticians engaged in data analysis, consultancy, and methodological research. It is a reference for clinical chemists, ecologists, and biomedical and other scientists who deal with development and validation of measurement methods. This book can also serve as a graduate-level text for students in statistics and biostatistics. P. K. CHOUDHARY, PhD, is Professor in the Department of Mathematical Sciences at the University of Texas at Dallas. Currently, he is also the Associate Head of the department. His research interests include development of statistical methodology for biostatistical applications, and he has published extensively in the field of method comparison studies. H. N. NAGARAJA, PhD, is Professor Emeritus at The Ohio State University where he has served in the Departments of Statistics and Internal Medicine and the Division of Biostatistics. He is a fellow of the American Statistical Association and the American Association for the Advancement of Science, and an elected member of the International Statistical Institute. His published works include Order Statistics, Third Edition (with H. A. David) and Records (with B. C. Arnold and N. Balakrishnan), both published by Wiley.